Every morning, which coffee do you crave the most? An americano? Cappuccino, or perhaps a latte? These are the most popular coffee drinks in the world. The only problem is… a decent cup of coffee (not those instant ones you find in your office!) is usually quite expensive. Wouldn’t it be nice if you could save $4 – 6 on a latte every day AND save a bit of time walking to your nearest cafe? Today, I’m going to show you how to pick the best espresso machine for home. Here's the best espresso machines for home based on our extensive research. We took into count of overall quality, ease-of-use, functionalities, and price. Let's begin! Let’s be honest. When you’re queuing for your coffee, you must’ve thought “wouldn’t it be cool if I could brew an aromatic cup of cappuccino and pour latte art like these skilled baristas here”? Well, now’s your chance to make that dream a reality. A home espresso machine will give you the opportunity to practice your skills and become a barista without having to pick up a part-time job. Even major espresso machine companies like La Marzocco support the idea of making espresso at home, as it gives a more pleasurable experience. If that’s not enough for you, here are some other benefits of getting your own home espresso machine. On average, milk-based espresso coffee ranges from $4 – 6 in coffee shops. If you buy one to two cups every day, that’ll quickly add up to over $1000 per year! With a home espresso machine, it’ll cost you way less per cup. According to GoBankingRates, you could get a good Nespresso machine for around $250, that means you’ll break even in 2 months if you buy a $4 coffee every day. Over the weekends, do you ever crave for more coffee? Or perhaps you’re running late to work and don’t have a chance to make a side trip for your morning coffee. With a home espresso machine, you’ll be able to fix all of that – more or less! In those lazy Sunday mornings, you won’t have to push yourself out and about to get a cappuccino. Instead, just walk over to your kitchen in your pajamas and enjoy. If you’re a true coffee aficionado, then you’ll know nothing is more fun than trying different coffee beans and grinds. With a home espresso machine, you’ll have the freedom to test all you want. You won’t be limited to one or two blends at a local café. Instead, you’ll have the freedom to test all the single origin coffee and recipes you want. If you’re like most, then you’ll have a favorite barista. Maybe he’s a nice guy, perhaps you guys get along, or it’s because he brews every coffee to your liking. But what if one morning, he's not working! Would you have the confidence to let a stranger control the fate of your day? What if he burns the coffee, would that ruin your day? Well, with a home-based espresso machine, it’ll no longer be a problem! You’ll have complete control over your coffee. You’ll be able to quickly pick up coffee brewing and adjust it to match your personal preference. The espresso machine is just the start of your coffee adventure. After you buy your machine, you have the option to customize and get more accessories to make your machine more fun to use. 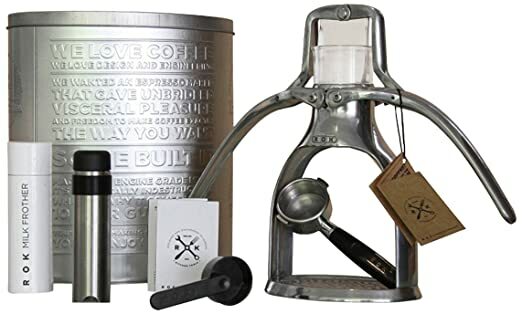 There are tons of optional gadgets that you can purchase for your espresso machine, from milk steaming pitchers, espresso tampers, to coffee grinders, and coffee scales. A true coffee geek can have fun mixing and matching to create a unique and personalized coffee experience at home. What Do You Need To Know When Buying An Espresso Machine? An espresso machine is quite complex. Before purchasing one, it’s important for you to understand the basic of how they work and what other tools do you need to maximize your coffee experience. There are many ways to extract flavor from coffee beans to the cup you love. Espresso is one such method. It’s a style of coffee extraction that forces hot water through coffee grounds at high pressure and as a result, create a super concentrated and aromatic coffee that we’re all familiar with. To brew a good cup of espresso requires patience, and knowledge. If you’ve never made your own espresso before, here’s an overview on how to brew your own espresso. In essence, an espresso machine uses a series of heating and piping systems to control the pressure and force of water flowing through your coffee grounds. A manual lever espresso machine does not use electronics to control the water pressure, but instead, sheer strength to make a shot of espresso. This machine uses a pull lever system to force hot water through the coffee grounds. While manual lever machines look good and produce great espressos, it doesn’t use any electronics to control the extraction process. As such, the barista will need to be heavily involved and have to know how to choose the correct brew time and extraction. All-in-all, it takes more experience and practice. They’re more difficult to master than other types. Automatic espresso machines simplify the process. It uses push buttons with preset timing sequences to pull the espresso and steam milk. These types of espresso machines are a great choice for people who want to enjoy espresso at home, but want to skip the steep learning curve normally involved. Super automatic machines take this one step further, it grinds, tamp and pulls the espresso shot for you. These machines will help you save both time and need to purchase extra equipment. Capsule coffee machines are espresso machines that use prepacked coffee pods. Backed by Ninja and Nespresso, these machines became popular back in the early 21st century. Designed for the ultimate convenience, capsule machine takes the words “hassle” and “mess” out of the coffee brewing equation. 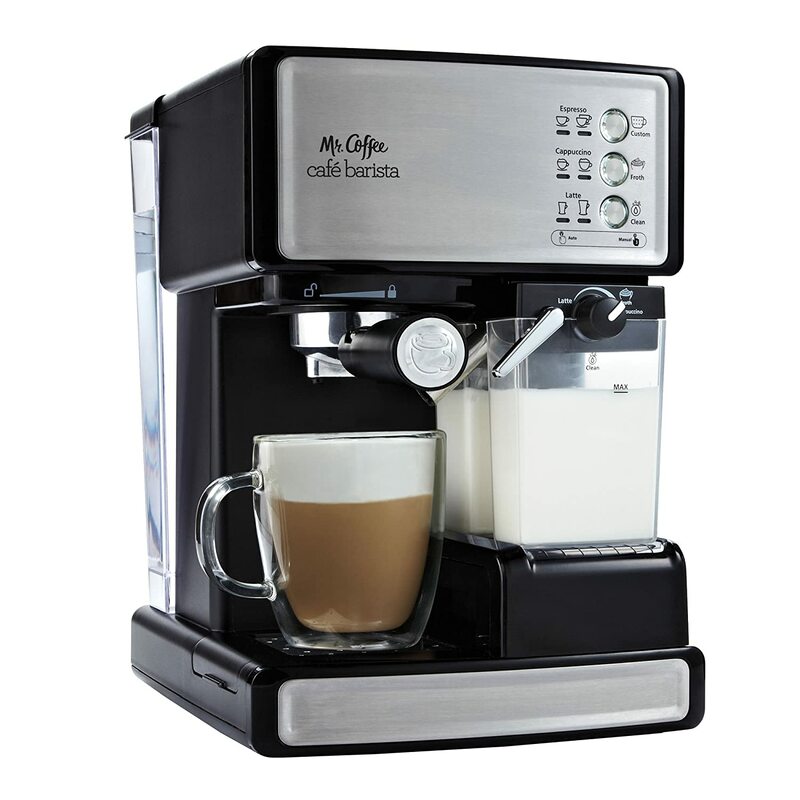 This type of coffee machine uses pre-ground coffee and milk extract to brew your coffee of choice. Similar to automatic espresso machines, a capsule-based machine will do everything automatically; from espresso extraction to milk steaming, everything! Single or Double Boilers: Which is Best? Water is what drives the two most important process in making espresso; milk steaming, and espresso extracting. Espresso machines uses two main types of boiler system; single and double – both comes with its own benefits and faults. In short, single boiler espresso machines are significantly smaller than double boilers, but there is a longer wait time between extracting espresso, and steaming milk. That’s because the two processes has very different temperature requirements. With a single boiler system, you'll steam the milk first, then either wait for the water to cool or manually purge it before you actually pull the espresso. This won’t be an issue for double boiler system. A double boiler has two separate tanks for two processes. This allows the machine to maintain a consistent temperature and for you to perform both actions at the same time. As you might’ve guessed, double boiler machines are expensive and can take up more room than the single boiler. When you decide which boiling system to go for, you should think about how many coffees you're planning to make. If it's just 1 or 2 in the morning, then a single boiler espresso machine would do. However, if it's going to be more, a single boiler will start to lose heat and pressure after a few cups. That'll result in bad tasting coffee and won't have enough pressure to steam the milk properly. It'll be better for you go for double boiler if that's the case. How Usable is the Coffee Machine? For home espresso machines, you should think about how easy and comfortable it’ll be for you to use the machine. See if the portafilter handle is comfortable, and check if it’s easy for you to secure it to the machine. You should also make sure there’s enough distance between the group head and the tray, so you can fit different size cups, or at least a 2oz shot glass. Lastly, you should look out for the displays and buttons. Are they placed at convenient places, or is it going to be awkward getting to them? How Much Space does the Machine Take? Home espresso machines are fairly big units, relatively the same size as a standard microwave. This means that they can take up a lot of space on your kitchen counters. When looking at an espresso machine, make sure that you understand its dimensions and amount of space you have available. Because they are heavy and difficult to move, make sure you set it up correctly the first time and that it won't take up too much of your valuable kitchen space. Do I Need Any Special Equipment & Gadgets? An espresso machine does not work by itself. It also requires some extra equipment to work properly. Many machines will come with a lot of these accessories when you purchase it, but others don’t. These accessories can be an unexpected expense so make sure that you are ready to buy these components on their own if they don’t come with the initial purchase. Fresh Ground Coffee, Pre-Ground Coffee, Coffee Pods: Which is Best? For the best espresso experience, you should grind the coffee beans yourself using an electric burr grinder. It's important to use freshly grounded coffee beans because the flavors trapped inside will dissipate the second it's grounded up. Ideally, you want to use fresh coffee beans that's less than an hour old, and even less for the very best results! Other than fresh or pre-ground coffee, there are espresso machines that uses coffee pods and capsules. A capsule typically contain pre-ground coffee but also milk extracts and sugar. While this is more convenient, ground coffee loses a lot of its flavors in the first hour, and nearly all of it within 24 hours. Therefore, I prefer coffee grinders that's catered more towards normal pre-ground coffee. I love coffee, but I know that in the morning I would drink no more than 2 or 3 drinks max. Which means for me, a single boiler, single group head machine would fit my needs. I also know that if I were going to buy an espresso machine for home, I wouldn’t want one with all the extra pieces just to make it work right. Therefore, I would recommend splitting your budget for a coffee grinder, and a single boiler espresso machine that will work on its own. 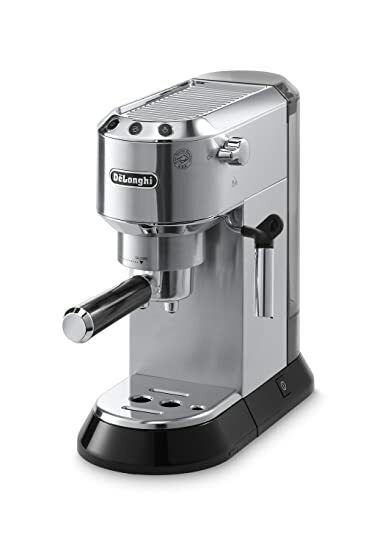 Despite that, if you're interested in all the extra, most companies usually offer discounts if you buy the espresso machine together with all its accessories. What is the Best Espresso Machines for Home? If you’re looking for the best home-based espresso machine, then you probably don’t want to break the bank and spend $1000s on it. As such, I’ve reviewed these more affordable espresso machines that’re under $200. The Breville BES870XL Express is an all-in-one coffee machine that does everything you need for a cup of perfect espresso. It comes with a conical burr grinder (specialized for coffee beans), and heavy-duty boiler system. The boiler system also comes with auto-cooling functionality, which adjusts water temperature between steaming and extraction, reducing your wait time. Despite all its positives, the Breville BES870XL is larger and more expensive than most of its competitors. However, it does give you more freedom and control over its pressure, extraction volume, and time. So if you're looking for an authentic coffee experience, this coffee machine is it! Using a manual lever system, the ROK Presso accurately replicates the correct amount of pressure you need from a high-end electric lever espresso machine. Other than its futuristic designs, it's unique because it's not electrical, and doesn't have any hot-water boiler connected to it. This makes the whole machine smaller and easier to transport. However, the ROK Presso has limited functionalities. You can't steam milk or brew more than one double-shot in one go, because you'll have to clean everything just to start over. Planning to get the ROK Presso Manual Espresso Machine? You might be interested in the ROK Manual Coffee Grinder too then! They go well together as a set, click here to find out more. 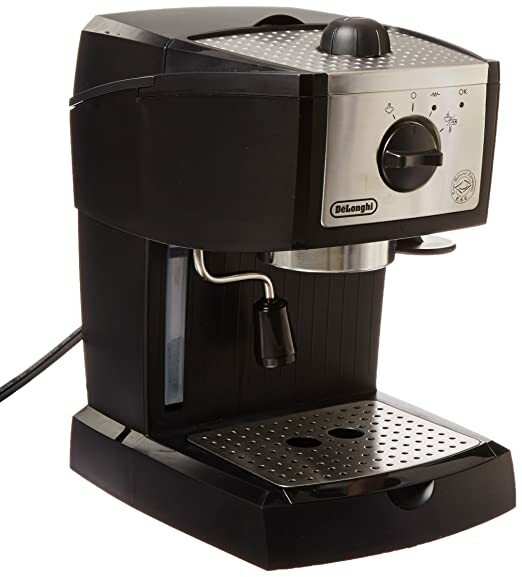 A slightly more solid machine than Mr. Coffee, the DeLonghi EC155 offers similar features with a detachable and easy-to-clean water tank. The machine is also designed to take both ground coffee or coffee pods/capsules. This Mr. Coffee System is an affordable machine that'll brew your espresso and steam the milk for your cappuccinos and lattes. The coffee machine is pre-programmed with single and double shot timings, as well as the ability to control how foamy you want your milk. Together with it's simple one-touch button system, it's an easy-to-use, premium espresso machine that's perfect for any milk-based coffees. The DeLonghi EC680M is sleek and easy-to-use semi-automatic espresso machine that gives you the enjoyment of professional-grade espresso. The machine heats up and reaches optimal pressure in under 40 seconds, which is comparable to specialized commercial espresso machines. 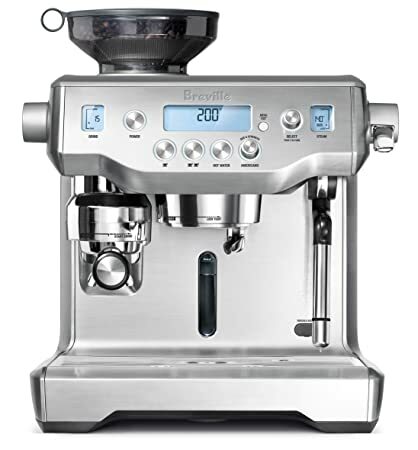 The Breville BES980XL Oracle is an updated version of the BES870XL Express. This espresso machine provides superior control and consistency. Utilizing a double boiler system, you'll be able to make multiple drinks consistently without worrying about quality drop due to temperature or pressure issues. Do you want to make an aromatic cup of latte, but don't want any fuss? The Nespresso VertuoLine Espresso Maker will do just that! 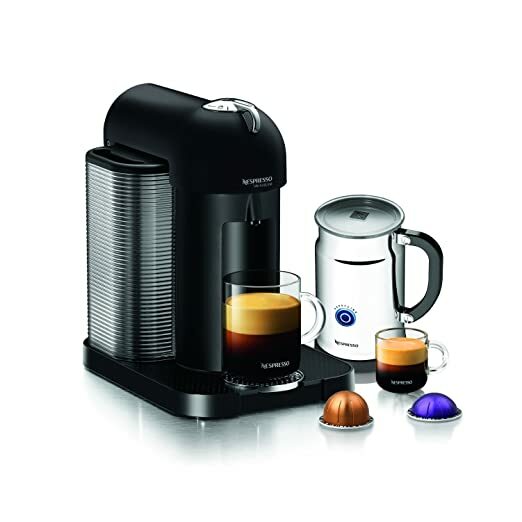 This specific model also comes with an automatic milk frother, which boost the flavors of all milk-based coffee drinks. Therefore, with the Nespresso Coffee Maker, next time you want a cup of cappuccino all you have to do is insert the coffee capsule in the machine, turn it on, and voila! 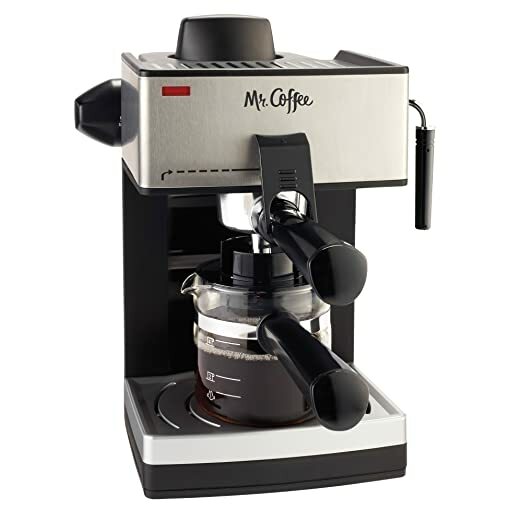 The Mr. Coffee Espresso Steam Machine is one of the most affordable machine in the market. Unlike their more complex competitors, this espresso machine uses a simple heating element that boils and forces water through the coffee grounds. There’s a milk steamer but it doesn’t come with a hot water spout or any other complicated functionalities. It leaks quite easily from experience. You’ll be able to make around 4 shots of espresso before having to wait for the system to cool down. In recent years, people are expecting more and more. 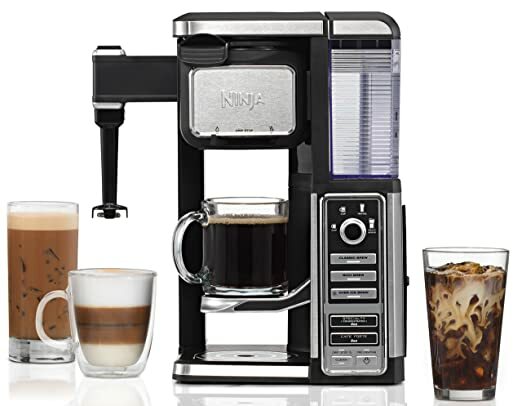 A completely hands-off approach has been gaining popularity recently and with the Ninja Coffee Bar Single-Serve System, this coffee machine solves the problem. As a pod-free machine, all you have to do is pick your brew type and size, and you're done. The coffee machine also comes with iced-coffee functionalities, which perfect for summer days. Of course this machine isn't for everyone. Some with find the lack of controls and timer to be a major turn off. I personally prefer a higher-quality espresso machine that can produce real coffee. 1) How much you're willing to invest? 2) How many cups you plan to make per time? 3) How spacious is your kitchen worktop? If your budget allows it, I would go for the Breville BES870XL Barista Express. This semi-automatic espresso machine includes a built-in grinder, which saves you both worktop space and money - you won't need a separate coffee grinder. Despite that, this coffee machine is still very large and takes a lot of space. 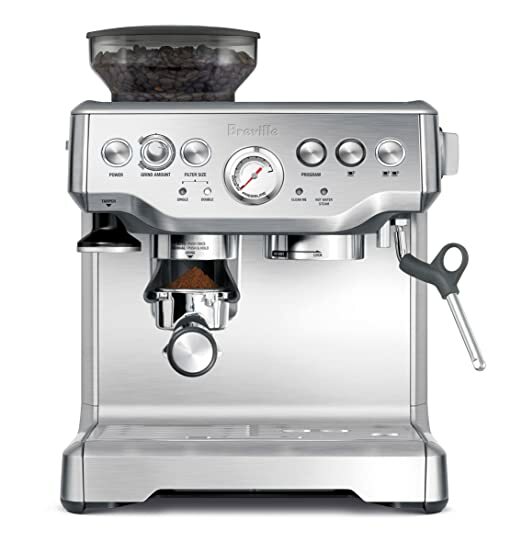 But all-in-all, if you have the kitchen space available, I think the Breville BES870XL is the best espresso machine for home due to it's sturdy exterior, all-in-on functionality, and short wait time. It's the perfect solution for espresso lovers who won't want to break the bank!